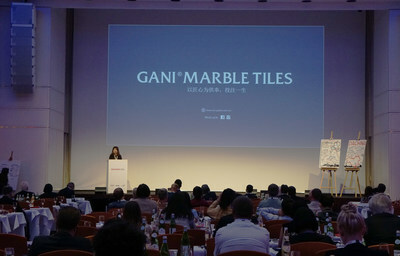 HAMBURG, Germany, Sept. 6, 2018 /PRNewswire/ -- On September 5th , as a major representative of brands from China, GANI MARBLE TILES joined other international brands including Alibaba, Midea, Volkswagen, and Mont Blanc by attending the first DACHINA Dialogue, at the Hamburg Hotel Grand Elysée, Germany. The DACHINA Dialogue is a branded conference held by the DACHINA Interchange Management GmbH in partnership with the Academy-Hochschule for Design and Communication and China Central Television(CCTV), which offers a platform for the exchange of concrete experiences and future-oriented concepts in brand management. During the conference, GANI brand manager Lijia introduced how GANI can stand out from the multitude of Chinese enterprises, stand tall on the world stage, and communicate with other international brands. All of this is as a result of the enormous effort GANI has invested in product development and branding promotion.